We’d love your help. 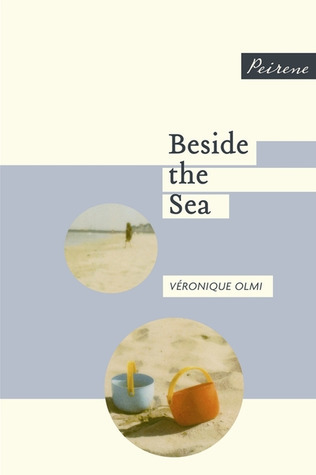 Let us know what’s wrong with this preview of Beside the Sea by Véronique Olmi. A single mother takes her two sons on a trip to the seaside. They stay in a hotel, drink hot chocolate, and go to the funfair. She wants to protect them from an uncaring and uncomprehending world. She knows that it will be the last trip for her boys. Beside the Sea is a haunting and thought-provoking story about how a mother's love for her children can be more dangerous tha A single mother takes her two sons on a trip to the seaside. They stay in a hotel, drink hot chocolate, and go to the funfair. She wants to protect them from an uncaring and uncomprehending world. She knows that it will be the last trip for her boys. To ask other readers questions about Beside the Sea, please sign up. Does being able to have birth to Children means you have the right to have them? How stable I mean ( mentally,financially) should the person be so that he could a baby? Who determines who have the right to bring children to this world? And if you had the child who determines you can keep your child, does the state have that right?or the social worker? What does it mean to be so poor in developed state? What does it mean to be single mother in today world is it? Is it What does it mean to be a mother? The city is unknown,the name of our female protagonist is unknown the town she is also headed to is also unnamed. “ We took the bus, the last bus at the evening, so no one would see us” from the beginning of the novel we understand there is some thing wrong here why is she leaving at night why is she doesn’t want to be seen? Whew! Not a great way to end the year......at least from a feel good standpoint. Veronique's Olmi's BESIDE THE SEA brings to life a very dark and intensely sad story so full of despair and hopelessness that makes me thankful it was a short 125 page read. In this haunting look at mental illness, a mother decides to take her two young children on a bus trip to the seashore for a bit of a holiday, and with only a few coins in the tin and her medication left behind, the desperation in her life takes a turn for the worse. We took the bus, the last bus of the evening, so no one would see us. So begins this distressing and ominous tale of a single mother taking her two boys to the sea. We don’t know why they’re going, although soon enough we can guess because things seem more than a little off. They find a hotel and a café, and they go to the beach; the mother is barely functional throughout and almost incapacitated by depression, insomnia and anxiety. We view the world filtered through her paranoia and it’s an unbe We took the bus, the last bus of the evening, so no one would see us. So begins this distressing and ominous tale of a single mother taking her two boys to the sea. We don’t know why they’re going, although soon enough we can guess because things seem more than a little off. They find a hotel and a café, and they go to the beach; the mother is barely functional throughout and almost incapacitated by depression, insomnia and anxiety. We view the world filtered through her paranoia and it’s an unbearable place to be. Everyone is a threat and even the smallest task is an insurmountable challenge. She’s fading fast. …the bells wouldn’t stop ringing, people were hurrying onto rides in every direction, where did all that money come from, everyone could afford everything, there was too much of everything everywhere, too much noise, too much rain, too many lights, all reeling past me and I didn’t know where I was anymore. She cannot focus or think. Life is overwhelming. We are never told exactly what is wrong with her, but we know she’s severely fractured. Bleak, hopeless, real. I wanted to get right inside myself, where nothing more could reach me. 5 star books are completely subjective and many people have their own criteria for what signifies a 5 star book. I don't have any specific criteria, honestly. Some feel like they are reading a work of genius, while the same work may feel menial to me. Some feel as if they are reading something redundant and a case of 'this has been done too many times' and give it a 2 or 3 and I still find that little something that puts me over that edge to give it a 4 or 5. Olmi's words make you feel. It's all 5 star books are completely subjective and many people have their own criteria for what signifies a 5 star book. I don't have any specific criteria, honestly. Some feel like they are reading a work of genius, while the same work may feel menial to me. Some feel as if they are reading something redundant and a case of 'this has been done too many times' and give it a 2 or 3 and I still find that little something that puts me over that edge to give it a 4 or 5. Olmi's words make you feel. It's all about feeling with this one. This book made me feel depressed, but depression isn't necessarily a bad thing to me. The words within bleed angst, paranoia, cynicism, pessimism and an overwhelming feeling of hysteria towards the world and its people; this is not a cry for help, but a way of life, a way of living, the only way she knows how -- for those responsible for others, this can be too much, so much that they have to use their bare hands to end it, to end it all. "You struggle to live the best you can but soon the whole lot disappears. We get up in the morning, but that morning doesn't actually exist any more than the night before, which everyone's already forgotten. We're all walking on the edge of a precipice, I've known that for a long time. One step forward, one step in the void. Over and over again. Going where? No one knows. No one gives a damn." "We took the bus, the last bus of the evening, so no one would see us." A mom and her two young boys. A spontaneous trip to the seaside. Disquiet. A bit ominous. What’s going on, mom? Mom is fraying, and has been for a while. There are only opaque hints of the backstory, of the life before this mini-holiday. It feels claustrophobic being here in her mind, there are two of us in here but it seems only one of us can see clearly. It’s clear this mom loves her boys above all else, and also painfully and poignantly clear that she can not cope with even a stripped down reality. Intense empathy. That is what this story evokes. So powerful. I'm loving these books from Peirene Press, "...first class European literature in high quality translation." This novella was a bestseller in France, "Bord de Mer", and was staged in London a couple of years ago. این جور چیزها همیشه به این معنی هستند که کارها خوب پیش نمیرود، که کارها به طور کلی خوب پیش نمیرود، که همه چیز از دست رفته است و اوضاع بدتر هم خواهد شد. چیز ترسناکی در انتظارم است و همهاش تقصیر من است. اشتباه کردم و حالا خیلی دیر است. سعی میکنم با این حس مبارزه کنم. سعی میکنم صدایی را در وجودم بیدار کنم که میگوید این طور نیست. هیچ چیزی قرار نیست من را بدرد. من هیچ اشتباه بزرگی نکردهام. فقط پرت و پلاهای بچگانه است. گافهای بیاهمیت که میتوانست خندهدار باشد. باید خندهدار میبود. کاری که از دستم برمیآی این جور چیزها همیشه به این معنی هستند که کارها خوب پیش نمی‌رود، که کارها به طور کلی خوب پیش نمی‌رود، که همه چیز از دست رفته است و اوضاع بدتر هم خواهد شد. چیز ترسناکی در انتظارم است و همه‌اش تقصیر من است. اشتباه کردم و حالا خیلی دیر است. سعی می‌کنم با این حس مبارزه کنم. سعی می‌کنم صدایی را در وجودم بیدار کنم که می‌گوید این طور نیست. هیچ چیزی قرار نیست من را بدرد. من هیچ اشتباه بزرگی نکرده‌ام. فقط پرت و پلاهای بچگانه است. گاف‌های بی‌اهمیت که می‌توانست خنده‌دار باشد. باید خنده‌دار می‌بود. کاری که از دستم برمی‌آید را انجام می‌دهم. غول که نیستم، یا مادر ایده‌آلی که همه چیز را بدون هیچ صدمه‌ای انجام می‌دهد. می‌دانم آدم‌هایی هستند که هیچ‌وقت صدمه ندیده‌اند. چه بد! باید اعتراف کنم که هیچ‌وقت شبیه آنها نخواهم بود. فکر مثل جانور کوچک کثیفی است. بعضی وقت ها ترجیح می دهم سگ باشم. شرط می بندم سگ ها هیچ وقت نه با خودشان فکر می کنند کجا هستند، نه اینکه باید دنبال چه کسی بروند، فقط هوا را بو می کشند و همه ی این ها همان جا برای همیه ثبت شده است. انسان ها حس بویایی ندارند. همین خطرناک است. عجیب است که هیچ وقت در خیابان مردم را در حال گریه و زاری نمی بینم. بیشتر از اینکه گریه کنند، با تلفن صحبت می کنند. شاید اگر بیشتر گریه می کردیم کمتر از همدیگر متنفر بودیم. فکر مثل جانور کوچک کثیفی است. بعضی وقت ها ترجیح می دهم سگ باشم. شرط می بندم سگ ها هیچ وقت نه با خودشان فکر می کنند کجا هستند، نه اینکه باید دنبال چه کسی بروند، فقط هوا را بو می کشند و همه ی این ها همان جا برای همی‌ه ثبت شده است. انسان ها حس بویایی ندارند. همین خطرناک است. بهترین بغل کردن وقتی است که هنوز نوزاد در شکم است. هیچ کس نیست که یادمان بدهد، بگوید زیاد تکانش می دهیم یا نه، به اندازه ای که باید تکانش نمی دهیم، بچه را بیدار نکنیم، اشتهایش را کور نکنیم، سرش را له نکنیم، فقط کنارش باشیم، فقط همین، فقط کنارش باشیم. یک داستان سیاهِ سیاه، به رنگ شبهای بارانی توصیف شده در کتاب، سیاه و بدون ذره ای نور و روشنایی، پر از سر در گمی و روان پریشی و فقر و فلاکت و تباهی. مادری با مشکلات عدیده روحی و روانی که در حال از دست دادن سرپرستی دو پسر خود است، برای فرار از این امر دست به مسافرتی به مکامی در مجاورت دریا میزند. به جایی میروند که جز تاریکی چیزی نیست، یک شهر دور افتاده و غریب و ساکت و کثیف و مدام بارانی. مادر مدام در ذهن و فکرش با خود حرف میزند، به گفته خودش او در دو دنیا زندگی می کند، یکی واقعیت یکی وهم و خیال. نویسنده به خوبی توانسته حالات روحی مادر و همچنین تصویر سازی مناسبی از فضای شهر و هتل را به خواننده القا کند. بخش تکان دهنده و پایانی داستان با روان خواننده به شدت بازی میکند و روح را ته ته مایه میرنجاند. This little book should have a consumer's warning. It is short, it is compelling, and it will take you to a place you never wanted to go. Not in a hundred years, especially if you are a parent or have ever struggled with depression. I am a great admirer of the translations published by the Peirene Press. They are original in content and perfectly calibrated to their short-novella length. Sorbets between heavier courses. In this belief, I took a break between two of the large sections of Richard Power's towering Overstory, hoping to cleanse the palate. Mistake! There is nothing cleansing about this at all; it draws you deeper and deeper into the mud. It is is a 100-page monologue by a woman who, one evening, piles her two boys, 6 and 9, into a bus to take them to the seaside. It is dark, it is raining, and the hotel is crummy—but still, they are on an adventure; they are away. Away from what? Bit by bit, we begin to ask questions. Is the mother fleeing an abusive relationship? What does she do for money? What are her plans after the storm-tossed beach and the screaming fun-fair? Is she even entirely well? Just arrived from Sweden. A sweet gift from my dear friend Bettie. The plot is quite similar to "Beloved" by Toni Morrison in a complete different context of course. However, I still think it's hard to understand, in this particular book, the children's destiny stablished by their mother. To think about. A mother takes her two young sons on a trip to the seaside. Sounds nice, doesn't it? There's even a bucket and spade on the cover. You can almost feel the warmth of the sun on your skin, hear the brass band playing a cheery tune. But this is not a nice little feel-good story about a trip to the sea. There's no sunshine, no brass bands, no sandcastles and laugher and sticks of rock. To get an idea of what this book is like, imagine that idyllic seaside trip viewed through a fun-house mirror - eve A mother takes her two young sons on a trip to the seaside. Sounds nice, doesn't it? There's even a bucket and spade on the cover. You can almost feel the warmth of the sun on your skin, hear the brass band playing a cheery tune. But this is not a nice little feel-good story about a trip to the sea. There's no sunshine, no brass bands, no sandcastles and laugher and sticks of rock. To get an idea of what this book is like, imagine that idyllic seaside trip viewed through a fun-house mirror - everything's distorted, everything's wrong, the music is off-key, the sea is hostile, the rain is constant, danger and madness lurks everywhere. It's a seaside trip you'd have in one of your darkest nightmares. It's one of the bleakest books I've ever read. Notice I said "bleak", not depressing. I didn't find the book at all depressing, although I can see how some people would. Personally I've always liked dark, so-called depressing stories. I remember that as a teenager one of my favourite songs was REM's "Everybody Hurts". My friends asked me why I liked a depressing song about everybody hurting and crying, and I was surprised - to me it was the opposite of depressing. It made me feel better to realise that everybody hurt, not just me. With literature, some of my favourite books have been depressing - a lot of the Russian classics like Crime and Punishment, pretty much anything by Dostoevsky in fact. More recently I loved Cormac McCarthy's The Road, again a pretty bleak read. My own first novel is not exactly cheery either. I think it's partly the same impulse to feel other people's pain so that my own life feels better in comparison - after the nightmare you do, after all, wake up. But it's also because I've always looked to literature to enable me to access the full range of human experience, including the experiences I wouldn't really want to have myself. If you're like me, I think you'll love this book. But I know that some people read to relax, or to cheer themselves up, or to escape into better worlds - if that sounds like you, then perhaps skip this one. The entire book is the internal monologue of a depressed, anxiety-ridden mother. A sense of claustrophobia pervades the book. When I found out that Véronique Olmi is also a playwright, it made sense to me - the locations are very limited, and are sequenced almost like scenes from a play: the bus, the hotel room, the beach, the funfair. The surroundings also heighten the sense of being hemmed in - on the bus it's dark and the countryside is invisible, so there's no sense of motion or progress or a world beyond the bus; in the town they're lost and confused; in the hotel room it's either dark or raining all the time, so although the children are always looking out of the window there's little sense of what's out there. Each scene feels contained, like a stage with a painted backdrop and nothing beyond. It feels very deliberately done, and for me it worked very well in focusing the attention entirely on the characters and in building up a sense of unease and tension. What you can't do in a play, of course, is have that inner monologue - everything has to spoken out loud. A novel lets you step inside the character's head, and in this case it's a very intense experience. It's quite a short book, but still, by the end of it, being in the narrator's head felt almost as unbearable for me as it clearly was for her. "There were a lot of people around us, unbelievable that there are so many people out there, specially so late, where are they all from, were they going to the same place as us, no way of knowing, they looked calm, lost in quiet thoughts." Early on, I found this kind of thing so unbearable that I doubted I would finish the book, but at some point I suppose I just got used to it. I think that by the time the characters and the story had me hooked, I paid less attention to the writing. By the end, I felt that it was perfect for the story - there's a lot of drama towards the end, and a spare, unadorned style works much better for that sort of thing than overwrought descriptions. "The others, you could tell, all felt safe and sound, you'd have thought they made this trip every evening. There was me losing track of where we were or how long it was since we left, and they just got more and more patient, some of them even slept, hands on their stomachs, mouths open, they knew the journey better than anyone, I was so afraid of missing the stop that I got up again to ask the driver." This idea - that everyone else is inexplicably at ease, while only she feels bewildered, recurs again and again, whether she's describing other people in town or at the funfair, or other mothers outside the school gates. It's reinforced by her odd sleep patterns, lying awake in the middle of the night and falling asleep in the middle of the day, so that she never knows what time it is, whether it's morning or evening, and she's always lost - both the hotel and the sea are discovered only by aimless wandering, trying to look as if she knows what she's doing, and then accidentally coming upon them. The hostility comes both from other people and the world in general. In the hotel, the staff never notice them, except for one time when the mother is having a severe anxiety attack and the hotel manager tries to calm her, and then extricates himself as quickly as he can. Mostly they are just ignored, the man behind the desk thrusting a key at them without taking his eyes off the football game on TV. They stop in a cafe, and the men drinking at the bar stare at them and then mock them for only having small change to pay with. At the funfair, someone knocks the younger boy's chips out of his hand and makes him cry. The elements also are against them - the sea is rough, the rain is constant, the mud clings to them, the damp won't leave their clothing. As perhaps the final mark of alienation from the world, the mother-narrator figure is not even named throughout the whole book. I suppose the mark of a good book is that it affects you while you're reading it and stays with you afterwards, and this one did both. It gave me a convincing insight into someone else's life, someone very far from me but with whom I can still empathise. The ending was brilliant. It was the ending I had expected, which usually is a disappointment for me, but in this case it worked because of the excellent description and also the fact that I cared so much about the characters by then. I expected it, but even as it was happening I was wishing it wouldn't. It made me cry, which is quite rare. I can see why the book was a literary bestseller in France and Germany - it deserves to be one in the English-speaking world too. Ordinary enough details, but with dark undertones — why leave so furtively? Why dwell on the unfinished jam? Even in this first paragraph, the seeds of the ending are sown, but the power of Beside the Sea lies in how the journey unfolds. Olmi gradually reveals just how fragile is her protagonist’s psyche: the narrator is a woman ill at ease with the world, reluctant to engage with other people, simultaneously protective of her children and at times uneasy around them. Reading this character’s story is an intense, discomforting experience; her words spill out in a torrent of clauses, pushing inexorably on to the conclusion, which has no less impact for being anticipated (and may actually have more). Beside the Sea is a superb character study that marks out Peirene Press as a publisher to follow. Recommended. 3.5 This little novella certainly packed a punch. Still trying to figure out where I had heard about this little book, I must have read about it somewhere because it is not a book I would have just picked up. Well written, very sad but realistic. Poignant look at a mother's desperation and the lack of social services to help her. Will now go back to reading my book about murder and mayhem, ala Cordova style. A single mother of two boys wants to take them on a little holiday near the sea. That might sound simple enough, but it is a major life event and challenge for this mother, who suffers from some kind of mental affliction that requires her to take daily medication. This trip is out of the ordinary and we experience it from inside the mind of the mother, the stream of consciousness narrative is so effective here, it gets inside your own mind as you read and we feel her sense of anxiety and the host A single mother of two boys wants to take them on a little holiday near the sea. That might sound simple enough, but it is a major life event and challenge for this mother, who suffers from some kind of mental affliction that requires her to take daily medication. This trip is out of the ordinary and we experience it from inside the mind of the mother, the stream of consciousness narrative is so effective here, it gets inside your own mind as you read and we feel her sense of anxiety and the hostility of the outside world, from which she wishes to protect her children. An incredible novella, I just couldn't give it any more stars, as I don't particularly enjoy going into that state and arriving at its inevitable conclusion. It is an interesting challenge, that an author would choose to travel inside the mind of someone like this and I am sure this was probably one of the works that the publisher Mieke Ziervogel read as research in writing her book 'Magda'. Poignant and thought-provoking too, given the issues that lie beneath its surface, this is the story that is never told and rarely understood by the public, who only see the end result and judge it too easily. This is the first book in the Peirene Press Female Voices: Inner Realities series. In sole 90 pagine Véronique Olmi riesce a farci penetrare nell'angoscia e nella disperazione di una madre mentalmente disturbata. Il ritmo serrato, l'alternarsi di frasi lunghe con la punteggiatura ridotta al minimo e di frasi molto brevi ci lasciano senza fiato, ci sentiamo soffocare; percepiamo l'ansia e l'angoscia di questa madre. Una madre sola decide di portare i suoi due figli, nove e cinque anni, al mare e partono di sera; è inverno, per tutto il racconto piove, fango sulle strade, mare in In sole 90 pagine Véronique Olmi riesce a farci penetrare nell'angoscia e nella disperazione di una madre mentalmente disturbata. Una madre sola decide di portare i suoi due figli, nove e cinque anni, al mare e partono di sera; è inverno, per tutto il racconto piove, fango sulle strade, mare in burrasca, tutto è grigio, sembra quasi di percepire l'umidità. Questa pioggia fitta e interminabile, la piccola stanza d'albergo, la gente per strada, tutto trasmette un senso di claustrofobia, manca l'aria. È un viaggio nella mente e nelle emozioni di questa madre malata, un groviglio di pensieri che la Olmi riesce a descrivere con lucidità e precisione. In the hours since finishing I've realized that I need to bump this up to 5 stars. Cannot sit at desk to compose reviews right now, but I'm promising myself I will catch up on some reviews this weekend. Beside the Sea is a translation of a French book Bord de Mer, the first novel from acclaimed dramatist Véronque Olmi. First published in 2001, this novel has been translated into all major European languages. On the surface, this seems to be a sweet story about a mother taking her children on a trip to the seaside. However, digging a little deeper reveals a darker undercurrent. This is no joyful jaunt to sun, surf and sand. Instead, we discover a deeply disturbed mother, already on the edge, afr Beside the Sea is a translation of a French book Bord de Mer, the first novel from acclaimed dramatist Véronque Olmi. First published in 2001, this novel has been translated into all major European languages. On the surface, this seems to be a sweet story about a mother taking her children on a trip to the seaside. However, digging a little deeper reveals a darker undercurrent. This is no joyful jaunt to sun, surf and sand. Instead, we discover a deeply disturbed mother, already on the edge, afraid for the life of poverty and exclusion that she fears her boys are destined to lead. Determined to give them at least one happy memory, she takes them on a holiday that she cannot afford and has not properly planned. We are introduced to the two little boys, Stan and Kevin, through the eyes of their mother allowing us to develop a proxy parental concern for them. The story is told from within their mother’s mind but she remains nameless, allowing us to feel empathy for her while still keeping her at arms distance. Seeing the experiences of this family through the eyes of the boys gives a sense of wonder and delight, but the covering veil of the mother’s thoughts and emotions and the constant presence of rain gives the story a continual sense of darkness that leads to a disharmony – a sense that something is not quite right. As a mother who has experienced the depths of depression, I can totally relate to this mother’s concerns and despair when she considers sending her boys out into this dark and dreary world. But the very fact that I am lucky enough to be on the road to recovery makes the climax of this book all the more tragic. There, but for the grace of the Gods go I. At only 111 pages, Beside the Sea is quite short, but don’t let that fool you into believing that it is a light read. It is not. This story will have you delving into the deepest, darkest parts of your soul and some may not like what they find. Overall, this is a superbly written book with a small but well-developed cast. The author’s theatrical influence can definitely be felt in the vividly described scenery and clear transition between scenes. The young family’s loneliness and desperation was so sad, and I was completely immersed in the mother’s unraveling. But I still gasped out loud when the novella reached its inevitable climax. This is a beautifully written story, but one that will haunt me for quite some time. A brilliant but disturbing book. This isn't a novel to read if you're depressed, but it's a book you should read. I found it disturbing and very moving. It was apparently a 'controversial' best-seller in France. Narrated in the first person, vernacular, it's the story of a young, single mother, who is struggling to cope - with her two little boys, with her own mental health, social workers, teachers, and inadequate money. We are totally inside her world and her head. It makes gut-wrenching readi A brilliant but disturbing book. This isn't a novel to read if you're depressed, but it's a book you should read. I found it disturbing and very moving. It was apparently a 'controversial' best-seller in France. Narrated in the first person, vernacular, it's the story of a young, single mother, who is struggling to cope - with her two little boys, with her own mental health, social workers, teachers, and inadequate money. We are totally inside her world and her head. It makes gut-wrenching reading. She has decided to blow all the money she can lay her hands on - which isn't much - on a trip to the sea-side for herself and the boys. They have never seen the sea and she wants to give them one last glimpse of it. She envisages a blue sky, sand, blue water, but it's winter and it's raining. What makes the book so brilliant is the way the young mother's state of mind is conveyed to the reader - the occasional dazzle of back-story glimpsed between phrases - the blink of a hidden meaning behind a particular word. What is also fascinating is the way she observes the world watching her - judging her - a million light years away from where she actually is. This beautiful little book gutted me. Veronique Olmi is a successful French playwright, and Beside the Sea is her first novel. The story is narrated by an unnamed mentally unstable woman, who barely manages to make it through the day, struggling with depression, insomnia, meds, poverty, a broken collarbone, exhaustion, chemical imbalance, and above all else, the crushing responsibility she bears for her two little innocent sons, aged 5 (Kevin) and 9 (Stan). Olmi eloquently describes the gut-wren This beautiful little book gutted me. Veronique Olmi is a successful French playwright, and Beside the Sea is her first novel. The story is narrated by an unnamed mentally unstable woman, who barely manages to make it through the day, struggling with depression, insomnia, meds, poverty, a broken collarbone, exhaustion, chemical imbalance, and above all else, the crushing responsibility she bears for her two little innocent sons, aged 5 (Kevin) and 9 (Stan). Olmi eloquently describes the gut-wrenching torture the narrator's mind puts her through, at the very end of her rope, as she steals her boys away in the dead of night, on a bus heading towards the sea. An unnamed woman is the narrator. She has mental health issues, has difficulties facing people, is terrified about dealing with life and what will happen with her two young children as they grow up and they too have to face the world. It is a depressing story. They are poor and malnourished. She is being assessed for being unable to properly care for her children. She takes a night bus to a seaside town. The bus is cold and old. It rains at the coast, the sea is frothing with anger. They stay on An unnamed woman is the narrator. She has mental health issues, has difficulties facing people, is terrified about dealing with life and what will happen with her two young children as they grow up and they too have to face the world. It is a depressing story. They are poor and malnourished. She is being assessed for being unable to properly care for her children. She takes a night bus to a seaside town. The bus is cold and old. It rains at the coast, the sea is frothing with anger. They stay on the 6th floor on a derelict hotel with no hot water, heating or lift. She has 52 Francs in coins as their only spending money. But the whole trip is planned with one very sad outcome. Endeavor to breathe through this one. My initial reaction was to give this 4 stars, but the only reason I could find for not giving it 5 is the very reason it deserved it -- it is hauntingly, searingly, heartbreaking. Extremely raw. Beautifully written, beautifully told. Arguably one of the most clearly drawn, nameless, first person narrators in the history of fiction. Not an ounce of pain is lost in translation. A schizophrenic woman takes her two boys to the sea for one last time. Even knowing from the back cover that this book would have a devastating end, it is the journey that intrigued me. To see her crumbling thoughts and emotions that got her there. It is a very sad and tragic book, but a powerfully engaging journey. In the beginning the punctuation was driving me to distraction - but once I got past that, it was sad and powerful. I wanted to read this in the original French but I have not been able to find a copy so I succumbed to the English translation. I am definitely going to want to read this in French when I can. It is so powerful; so haunting; and so extremely sad. A splendid short read about a mother who desperately wants to protect her kids from the world. I really enjoyed this book. It's an observational story told from the point of view of the mother. A mother who has her own battles. Dealing with depression, anxiety, panic attacks, and probably schizophrenia while also doing her best to raise her 2 sons. She is alone in the world. She has no one and feels as if everyone is out to get her. It's a story that grimly reveals the struggle to live life. The s A splendid short read about a mother who desperately wants to protect her kids from the world. It's a story that grimly reveals the struggle to live life. The struggle to feel as if your life is valid and worth fighting for in a world that will easily shut the door on your face the moment you slip up. A world where you just end up being categorized to an ID number that gets forgotten about. A fact that is especially highlighted by the fact that you never learn the mother's name. The prose of this book was splendid. Olmi did a beautiful job capturing the attention of the reader. Making them bounce back and forth between sorrow and shame and then finish them off with a gut wrenching end than throws them out of the ring. The mother's decision at the end of the book is understandable. Based on her life and experiences; knowing that one day her kids will grow up and join the world she has deemed as cruel, her decision evokes pity from the reader. You knew this was going to happen but as you go through the story and see life from the mother's perspective you come to the realization on how tough life can be for people. There were so many comments the mother makes that really strike the reader through the heart. It's a very short read that asks us to stop and think about how we have assembled our society. Have we done a good job if many people struggle? If many are forgotten about and ignored? Completely shattered after reading this - and yet I could not set it aside. Yes, a difficult read, especially if you are a mother of two boys yourself, but it exerted a powerful fascination. A language at once simple, unadorned, conversational and yet poetic. The back story is merely hinted at, never overtly stated. You are never in any doubt about the outcome (plus it has been so publicised that I think everyone knows about it without even reading the book). But it is remarkable for showing how Completely shattered after reading this - and yet I could not set it aside. Yes, a difficult read, especially if you are a mother of two boys yourself, but it exerted a powerful fascination. A language at once simple, unadorned, conversational and yet poetic. The back story is merely hinted at, never overtly stated. You are never in any doubt about the outcome (plus it has been so publicised that I think everyone knows about it without even reading the book). Heart-wrenching. The first person narrative of this story of a young woman unable to cope with life, let alone taking care of her children gives it a real immediacy. You are completely absorbed by her inner monologue as she tries to face the world when she takes her two boys to see the sea for the first time, how almost every small challenge defeats her and her fractured attempts at coping as the tale hurtles towards its inevitable conclusion. This book is suffocating, haunting, and quietly terrifying. It's about madness and motherhood and a fine, fine read. Review forthcoming! Beside the Sea is the story of a mother and her two sons, off on a trip to a small unremarkable town located near the sea. As the book opens, we can see hints at the mother having suffered from something or someone; has she gone through some psychosis that is still shaping her actions and being, has she been the victim of domestic abuse? It’s never explicitly said, although the frequent references to both social workers and psychiatrist meetings confirms that something has gone wrong in this wom Beside the Sea is the story of a mother and her two sons, off on a trip to a small unremarkable town located near the sea. As the book opens, we can see hints at the mother having suffered from something or someone; has she gone through some psychosis that is still shaping her actions and being, has she been the victim of domestic abuse? It’s never explicitly said, although the frequent references to both social workers and psychiatrist meetings confirms that something has gone wrong in this woman’s life; and that this trip is possibly her running away from it all, from failures or fears, from other people or some part of herself. Along with her, she has her two boys; both young and unsure about the reasons for the trip or what’s to come in their futures. They seem to be sensing the slow disintegrating of their mother, but are unable to do anything about it. The book follows a short period of time, where these three characters move around in the hotel with the six floors - their hotelroom on top, and walk around in the town, visit the raging sea and go to the local fun-fair. Ultimately this book mostly takes place in the mind of the mother though, her thoughts bouncing off of the things she sees - other people’s happiness and wealth or the moonlight through the room’s window; she looks back at her life and we see glimpses of it, while also getting hints on her future or what is about to happen. Véronique Olmi is a French playwright and novelist. She won the Prix Alain-Fournier emerging artist award for her 2001 novella Bord de Mer. It has since been translated into several European languages. Olmi has published a dozen plays and half a dozen novels.